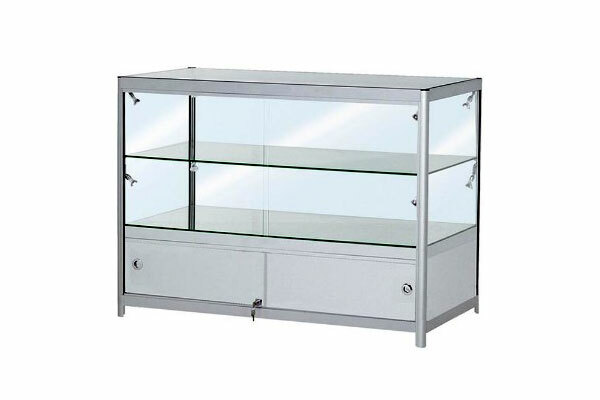 New to our ever-expanding range of glass display cabinets today is our brand new double tier glass showcase which is the perfect stand accessory for professional trade shows and exhibitions. Complementing our existing selection of showcases which includes tallboys, tall centre showcases and low glass cabinets which also act as counters, these dual tier showcases have - as you might expect - two internal glass shelves and a very useful lockable cabinet at the base for small items and literature. Adding to the overall styling are the four internal LED lights, making these glass counters perfect for jewellery shows and other similar events, where you want visitors and guests to be able to see your products up-close but, at the same time, maintaining a degree of security. The glass shelves are made in tempered glass and the showcases have chrome plated fittings to ensure a professional finish. If you need to hire exhibition glass showcases for your upcoming event, don't hesitate to contact the furniture hire specialists here at Event Hire UK.